This later model was the new era of design for Norman . The cockpit was built right out to the hull sides to maximise the space available. The boat was only produced for a short time in the early 80s. 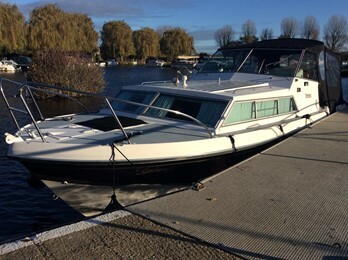 This modern design offered an open plan design and there was an option of an additional 2 single quarter berths at the aft end of the cockpit.This set of mouldings went on to become the Bates Astral and the highly successful Shetland 27 still in production today.The semi displacement hull handles well at low speeds. The engines were usually Ford petrols or BMC diesels.